Lexus develops its vehicles and technology under umbrella of Toyota Motor Corporation’s (TMC) ‘Integrated Safety Management Concept’, one part of a three-pronged approach which involves continual improvement in vehicle safety as well as initiatives to improve driver and pedestrian awareness and to create a safe traffic environment. The safety of occupants in a collision begins with the construction of the vehicle itself, and Lexus vehicles benefit greatly from decades of research and development by Toyota Motor Corporation (TMC). Since 1968, TMC has designed and built its vehicles to have impact-absorbing body structures that will crush in the event of an accident, soaking up as much energy from the collision as possible. In 1987, TMC further improved occupant safety with the introduction of a high-strength safety cabin that dissipates energy throughout the entire body and minimises damage to the passenger compartment. Toyota Motor Corporation, Lexus’ parent company, introduced the three-point seatbelt in 1967, and the humble but vital restraint device has been saving lives ever since with little significant change to its design. Seatbelts are immensely strong – capable of withstanding a weight of two tonnes – and are designed to control the movement of occupants within the cabin, particularly by limiting any impact to the chest during an accident. Yet they are also comfortable to wear in everyday driving, essential in encouraging occupants to use them on every trip. In 1991, TMC added pretensioners to seatbelts, a mechanism that instantaneously retracts the seatbelts when a strong frontal impact is sensed. This, in effect, quickly clinches the seatbelt to remove any slack in the belt and tightly grip the occupant before the full force of the impact is felt by the body. Force limiters were introduced in 1997 and work in harmony with the pretensioners to protect the occupant while minimising the impact of the seatbelt itself to the occupant’s chest. Force limiters maintain an adequate amount of tension on the seatbelt to restrain the occupant without the force of the restraint causing injury. Seatbelts with pretensioners and force limiters are fitted to all Lexus vehicles. Just over half of injuries sustained in accidents in Japan were as the result of rear-end collisions, but approximately 90% of those injuries were neck injuries. That’s why Toyota Motor Corporation (TMC) developed the Whiplash Injury Lessening (WIL) concept seat, which first debuted in 1997 and was updated in 2005. The WIL concept seats are designed to cushion and support the occupant’s head and chest simultaneously, minimising the injury occurring from the head and torso moving in different directions. 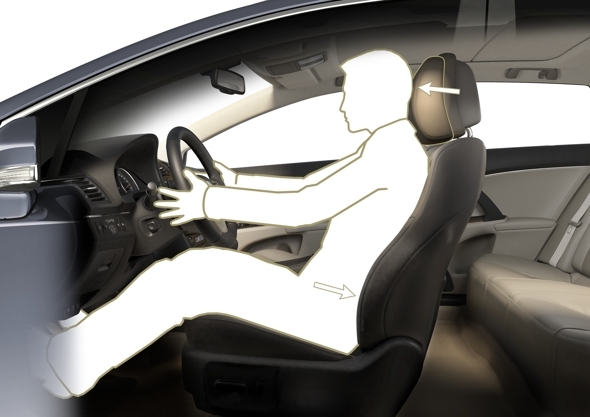 TMC used its THUMS virtual-human computer modelling to confirm the effectiveness of the WIL concept seats in reducing whiplash injuries in lower speed rear impacts. WIL concept seats are fitted as standard to all current Lexus models. Active Headrests, introduced in 2007, are an extension to the WIL concept seats that further minimise neck injuries in rear-end impacts. A sensor in the seat is triggered by the lower back pressing into the seatback and activates the active headrest, which moves diagonally upwards and forward to catch the back of the head. This technology decreases the severity of whiplash injury by a further 10-20% compared with the WIL concept seat on its own. Active Headrests are featured on Lexus RX 450h and LS models. The first SRS (Supplemental Restraint System) airbag was fitted to the original Lexus LS400 in 1989, providing protection solely for the driver. Since then, Lexus has expanded SRS airbag systems throughout the passenger cabin to the extent that some models have as many as 11 airbags that create a protective cocoon around their occupants. SRS airbags are triggered in the event of serious collisions, inflating rapidly to produce cushion the occupant and reduce the risk of severe or fatal injury. Dependent on the model, SRS airbags include front airbags for head and chest protection (including the world’s first dual-chamber airbag), knee airbags, side airbags, curtain shield airbags, seat cushion airbags and even a revolutionary rear seat cushion airbag specially developed for the Lexus LS 600h L.
ISOFIX is an internationally recognised standard that sets out the specification for secure anchoring of child safety seats in cars, consisting of two anchor points at the base of the rear seats and a top tether point. ISOFIX greatly reduces the risk of improperly fitted child seats, thereby increasing the safety and effectiveness of the child seat. Occupant safety is a priority for Lexus, so all Lexus vehicles are equipped with ISOFIX child seat mounting points.